Henri Salvador is still singing the soundtrack to our grandparents' lives. Well into his eighties, he continues to weave lush, beautiful music that blends American jazz, French chanson and Brazilian samba into the kind of exotic spell that Martin Denny and Herb Alpert only hinted at. That this contemporary of Sinatra, a man just two years younger than the Chairman of the Board, is not only still alive, but still performing at the peak of his artistry, is only slightly less than a miracle. Or at least a testament to good genes and better living. Unlike horn players, keyboardists or guitarists, singers are not often able to continue performing into their 80s, at least not at the level they (and we) are used to  the pipes tend to thin with age. We witnessed it with Sinatra, with Peggy Lee and Rosemary Clooney. While most of his generation has been silenced by time, Salvador croons on. Two new albums in the last year (see the review of Chambre Avec Vue), show his skills are still being burnished by experience, not tarnished by time. Backed by both a small jazz/chanson combo (guitar, bass, drums, keyboards) and a full orchestra, Salvador caresses 18 songs that don't so much range over a variety of styles as encompass all of them in varying portions. Born and raised in French Guiana, Salvadar's style is a charmingly seamless blending of French sensibility and Afro-American rhythmic structures. The result is the most romantic music one can imagine. The quietly insistent Brazilian rhythms gently pull the listener along, while his Guianese accent softens the edges of his French lyrics. And the jazz that's mixed in throughout adds a certain candlelit mood that invokes memories of Bogie and Bacall, Astaire and Rodgers. 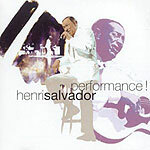 Ultimately, the music of Henri Salvador is the pure musical expression of elegance and grace. The man is class set to music.